Hello! My friend Cassie, whom I have known since high school and just love, has a weekly blog feature called Tasty Tuesdays that she puts out to share her wonderful food creations. Every week I am left craving whatever she has posted, so I thought I would link up this week for the fun! 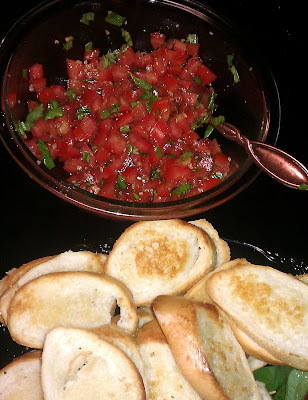 I don't know if it was because of my hormones, or more related to the farmer's market produce I picked up, but Sunday after work all I wanted to do was make appetizers to eat. 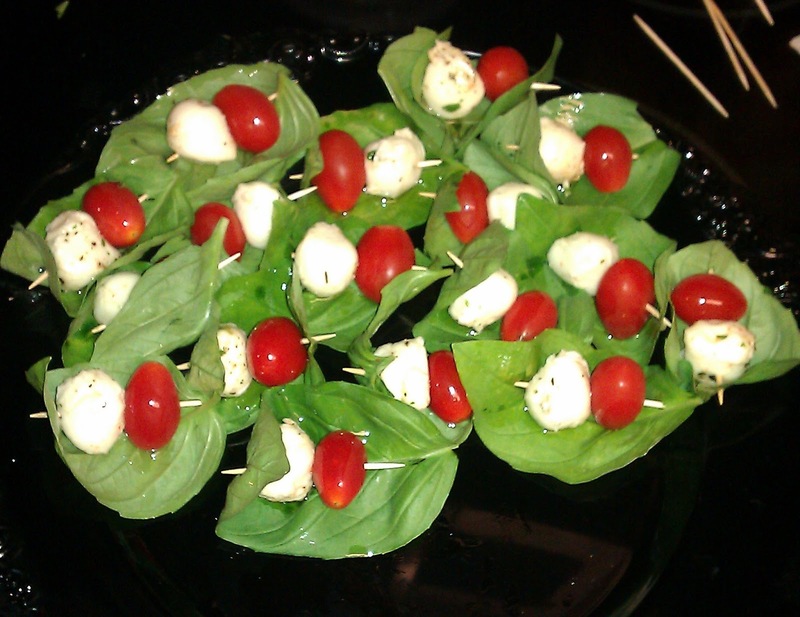 I had bought a bunch of basil while the market was in full swing outside my salon, and had the idea that I wanted to make easy caprese skewers when I got home. As I shopped for the mozzarella at the store after work, my one dish idea turned into three! Because of the basil and tomatoes already on the menu, bruschetta was definitely in order, and then guacamole became a necessity also. Yup, two dips and a skewer. It's the first time all week I have wanted to sort of cook, so I went with it. Thankfully we headed over to Billy's family's house to celebrate mother's day and I was able to take my dishes to share. 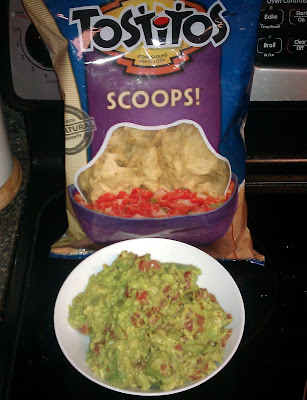 The last time I made guacamole I ate the whole bowl in an afternoon. Probably not a good idea. Lucky for you, I am sharing the recipes I used to indulge my cravings! Starting with large basil leaves, thread a toothpick through one end, and add a tomato, follow with a ball of mozzarella, and bring the other end of the basil leaf around and thread onto toothpick. Repeat as necessary until you have assembled as many skewers as you would like, or run out of any ingredients. Easy, and so fresh and tasty! Preheat oven to 450F. Slice tomatoes in half length wise, and remove seeds and juice. Chop finely and place in a medium bowl. Add minced garlic, olive oil, vinegar, and chopped basil. Give a good stir to combine, and season to taste with salt and pepper. Slice baguette on the diagonal. Brush with olive oil, and place oil side down on a baking sheet. Bake for 4-5 minutes, or until just golden brown. You can top the baguette slices with the bruschetta mix and serve, or allow your guests to spoon the mixture on themselves. Halve each avocado, remove pits and scoop flesh into a large bowl. Add lime juice and toss to coat. Add salt, cumin, and cayenne, then using a potato masher or a ground meat mixer, smash the avocado flesh until it's mostly creamy with some chunks, or to a consistency you enjoy. Fold in tomato and garlic. Serve with chips. Thanks for the linky!! Totally made my day! And that looks delicious!!! Love you!